It is supposed to be raining buckets this evening, so have got in early. Truly, we’ve had a magnificent lot of rain this winter – the trees should do so well. 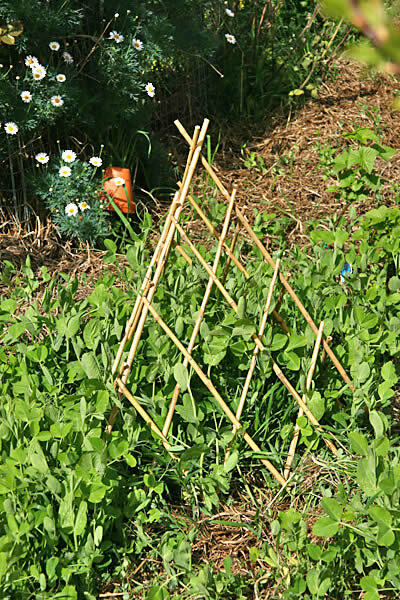 Yesterday and today I bought the local nursery out of bamboo wigwams for peas. I suddenly noticed they had them, and they were as cheap as chips, so couldn’t resist. The shop owner said he’d get some more in by Wednesday. 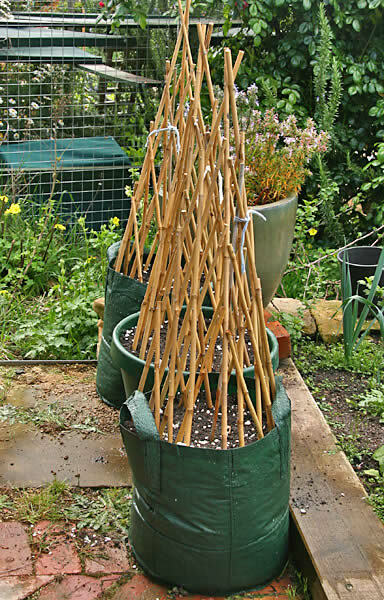 These wigwams are terrific for peas, and so today I have been madly pea planting (Massey peas). First, this is a shot of some of my free peas from the mulch, with one of the wigwams popped over them for some support. Here are three pots (or bags) of Massey peas all set up to go. In front you can see one of my new grow bags with handles. Love these to pieces! I am using them all over in places where otherwise I can’t plant, and they are much cheaper and easier to move than pots. You can use them year in, year out. 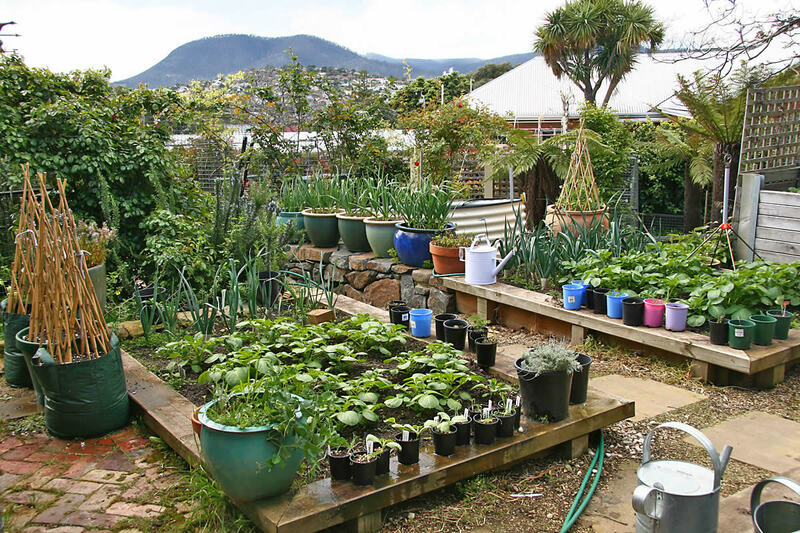 Here is a view of the back vegie garden – lots of potatoes, leeks, garlic etc. Mt Desperation in the background. This one you can click for a larger view. And of course the flowers are starting in now. 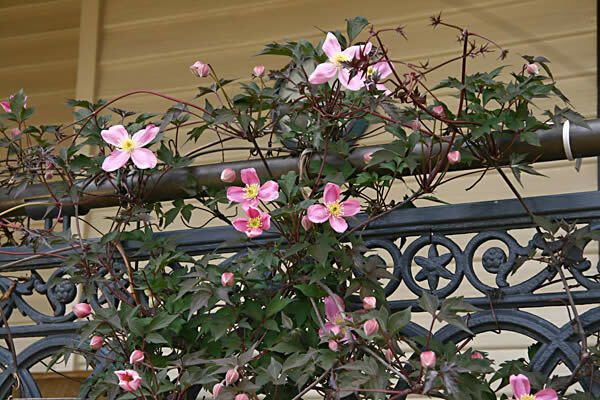 Here is the clematis on the eastern veranda – eventually it will cover the entire veranda: glorious. And some of my favourite flowers, picked for the office: arums. I love these. They are so simple and so elegant. My goodness Sara, how are you going to eat all of this? My family would have pink kittens if I extended my garden to even a quarter of yours! Mind you that is a good threat to get a few other things happening around here. Do you have any help to weed/water/harvest all of this – how do you find the time? Nicole – the hardest work is in actually making the garden. Then in the winter, the work of digging over and preparing the beds (a couple of weekends). But once spring comes it is just plant, water, and do a bit of weeding from time to time. And, of course, enjoy the produce! Back in the days, say of the 1950s and 60s, when lots of families still had backyard vegetable gardens, it was relatively little work – generally the garden was Dad’s domain and he worked it perhaps one day a weekend. For instance, I know there was a big vegetable garden and orchard here during the 1940s-1960s, and that was worked by the man of the house, who had a full time job as the director of the Cadbury factory; he just worked it on the weekends (a few hours a day). It has been lots of work for me this winter because I was building the seven new raised beds, plus I had to correct the damage wrought by a year of not being able to do anything at all, and weeds had taken over, but that isn’t usual. Mary, I do not ever think I will ever stop enjoying the rain here. I came from a particularly dry spot on the mainland, and I grew to loathe the heat and the all-consuming dry and the havoc it wrought on landscape and humans. I came back to your site after a few days and my eyes and my soul have been rewarded by beautiful pictures of your veggie garden – not surprising as your garden has always been so tidy and lush. Great to hear the kitchen renos are going strong, and love that French Provincial theme. And your sweet potatoes, yes, they will grow roots and if you leave them long enough they will even grow leaves, but your plan is to plant them in the garden anyway. 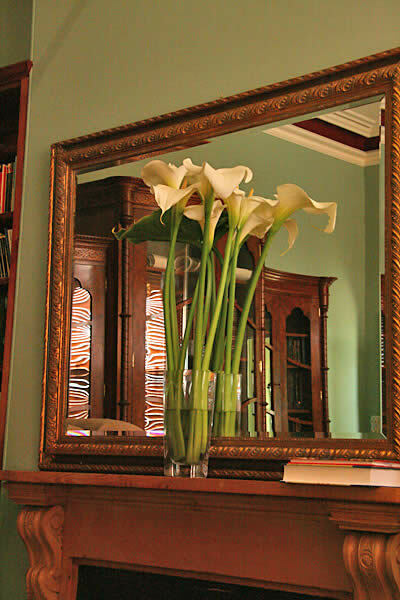 The arums look gorgeous against the gilded mirror. I am enjoying your site after a few hours of hard gardening work. The grow-bags are a new one on me – like the idea. 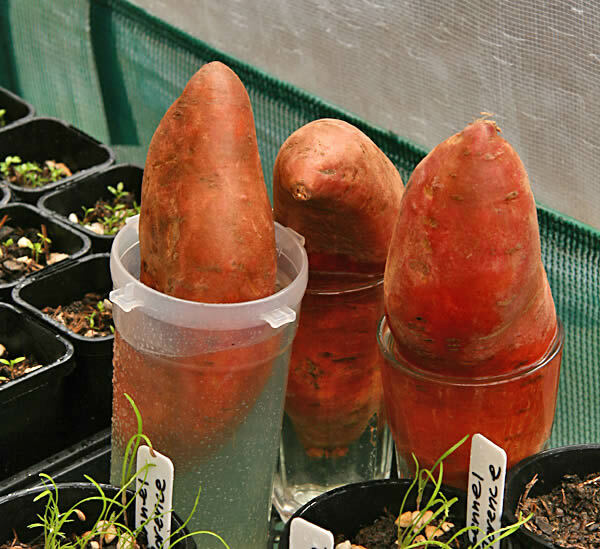 I have planted sweet potatos a number of times – got them growing but never to set new tubers before it got too cold for them – (we live at 6000 ft and our growing season is very short) Have yours grown? flourished?